VW's U.S. factory (shown under construction) will be similar to its plant in Russia. CHATTANOOGA, Tennessee -- After two decades of trying to serve the U.S. market from a low-cost production base in Puebla, Mexico, Volkswagen is returning to the United States with an entirely new strategy. The German company is preparing to build cars here, relying on local suppliers, taking advantage of lower transportation costs, and tapping U.S. managers and engineers. The concept is vastly different from VW's plan of action when it built cars in Westmoreland, Pennsylvania, in the 1970s and 1980s. It was the first transplant auto assembly operation n the Unitd States. And VW wants its U.S. assembly plant, now under construction on the 1,350-acre site of a former U.S. military explosives plant in Chattanooga, to be up and running quickly — in time to enjoy the snapback in U.S. auto sales. To achieve that, Volkswagen has adopted the model for flexible, standardized factories that it has used elsewhere in the world. "Chattanooga is integrated into a global Volkswagen strategy," said Stefan Jacoby, VW Group of America CEO. The United States is "our weakest market in terms of penetration," he said. "We can't be a global player without having a decent market share in the United States." The first assembly plant on the Chattanooga grounds will yield 150,000 units annually of what VW refers to as the "new mid-sized sedan." A second plant on the site is likely to follow, Jacoby said. And with nearly 2,000 adjacent acres being made available to Volkswagen and its suppliers, there is room for still more. The Chattanooga project is based closely on the plants VW has built recently in Russia and India, Jacoby said. By using standardized factory designs, common production equipment, modular tooling and shared components, VW hopes to develop and launch niche vehicles rapidly as opportunities arise. And as the market moves in new directions, the factory will be able to follow. Project managers say they will have cars rolling onto dealership lots in early 2011. A key to making that happen will be bringing suppliers onto the site this year, said Tom Loafman, VW's director of purchasing. Only a few suppliers have been identified so far, but the selections indicate that VW is open to new suppliers. Among the chosen is M-Tek Inc., a Japanese producer of door trim that came to the United States in the 1980s to supply Nissan's plant in Smyrna, Tennessee, 170km away. 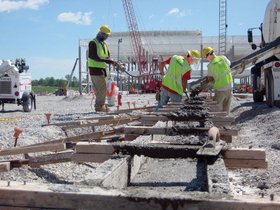 M-Tek has long operated out of Manchester, Tennessee, about halfway between the two sites. Loafman, who was recruited from General Motors, wants half of the new sedan's content to be carryover components from the next-generation Jetta now being sourced for production in Mexico. That will enable VW to launch the Chattanooga sedan faster. He said North American content could reach 80 percent, a target made easier because the car will be sold exclusively in the United States. "Our design criteria can be more localized than if it were a global model," Loafman said. "We won't have to import material that isn't available in North America." Volkswagen hopes to speed up the task of training production workers, technicians and team leaders by hiring workers from Nissan. Few transplant automakers in the United States have had the luxury of recruiting workers from other transplant factories. VW's situation is unique. It is hiring in Chattanooga just as Nissan completes a downsizing in Smyrna. Nissan offered voluntary buyouts to its entire 6,000-person Tennessee work force in 2008. More than 1,000 people accepted. Since VW closed its Westmoreland factory in 1988 and moved all production for the region to Mexico, U.S. automakers have absorbed a textbook full of Japanese-influenced production practices. It is no coincidence that Volkswagen chose as its plant president one of Toyota Motor Corp.'s top American factory bosses, Don Jackson. Jackson was around for the startup at Toyota's giant Georgetown, Kentucky, assembly plant in the early 1990s and was later in charge of the Tundra pickup truck plant in San Antonio. At San Antonio, Toyota placed more than 20 key suppliers on its property, including some that make parts inside Toyota's plant. The concept was designed to help suppliers respond faster to Toyota's needs. Volkswagen is now working on a similar concept. By the time the sedan reaches production, the empty expanse of land that currently surrounds the VW project will be populated by supplier plants, Loafman said. He has been out speaking to community leaders, suppliers and real estate developers — discussing ideas for making on-site supplier locations more attractive. Loafman said his team is working with local government officials and suppliers to persuade private investors to build supplier plants and lease them back to the manufacturers. Jacoby said the timing is perfect to construct a plant since it will come on stream in 2011 as the economy rebounds and auto sales bounce back. "We are going to be ready for takeoff when the economy recovers," he said. "We're not backing off one inch. It is not a risk — it is an opportunity."